What is it about parenting that brings out all your weaknesses? Your demons? Your fears? I had considered bettering myself prior to having kids; I bought a number of books and would take notes and underline and resolve. But then . . . I was working long hours with a commute, and when it came down to it, I didn’t really have the energy and time to be committed to the changes I wanted for myself. I’m 31 years old, and yet I have only started to realize who I am. Do you know who you are? Could we sit here and be honest about you? When you become a parent, you never actually lose yourself . . . you may become a different version of yourself, but your core is still the same. The community I live in is very connected and social. There are play dates and moms’ clubs and moms’ groups of all sorts of themes on a daily basis. The social calendar in my town can be as full as you want. You know how full my calendar is ideally? One activity a week. I’m totally fulfilled with a slim calendar. However, it seems as though I live in a community of extroverts where the job done as a parent is judged by the amount of activities you are involved in. I know I started this out with a question about weakness, but I honestly do not consider myself to be weak any longer. I did even as recently as six months ago, but no longer. I haven’t always been so great about my self-care, largely due to the fact that I didn’t know what I was doing. Growing up, my self care involved alone time in the backyard with a book. My life right now doesn’t often lend itself for alone time, though. And then a friend of mine talked about how she works her alone time in by going out early on a Saturday morning, leaving her boys in the care of a willing husband, and she comes back when she misses them. An Experiment: Does Alone Time Change My Parenting? My friend is a very extroverted person and loves to be social, but the mere fact that she chooses to step back and allow herself alone time amazed me. For one month, I made an effort to see if alone time to recharge would change my parenting. Honestly, the first time I slipped away for the sheer pleasure of wandering a bookstore for half an hour, I cried. The kids cried. It was not restorative. However, in the end, embracing my need for quiet time has been one of the best things for myself and my relationship with my husband and children. Now that I know when I’ve reached my communication limit and take even just half an hour to go stand – alone – in the basement and fold laundry, I’m a much more patient and gentle parent. Sometimes, I wait until the little ones are asleep to go to the gym. Other times, I say good bye and am now ushered out the door with “I love yous” and “have funs” instead of tears as I head off to a fabric shop for my latest project. The key point I’m trying to make is that when I get home, I am so glad to be parenting again. I miss my children and I’m ready to answer the questions, listen to the lengthy explanations about superhero interactions and comfort teething pain sensitively. I was always under the impression that if I took time for myself, I was selfish. But now, I realize that by leaving my children in the care of my husband or other family, I’m encouraging bonds to be built between them. My need for self care isn’t selfish or a weakness, it’s healthy. And it’s healthy for you too. What makes you tick? What refreshes you and makes you renew your love for parenting, your children and your partner? When you can embrace your needs, you can make steps toward internal peace which will lead to external peace in your home. Thanks for writing this. It is so true! 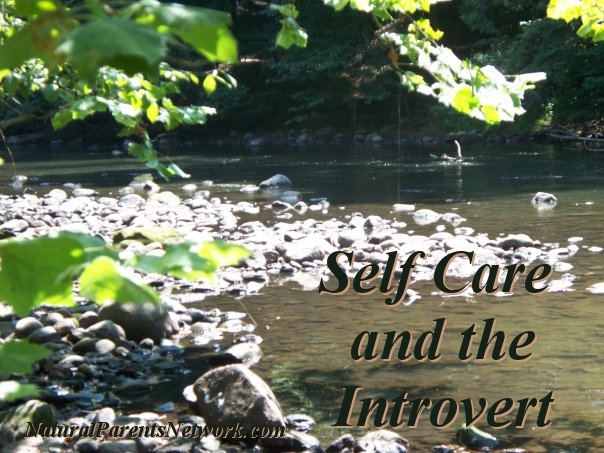 I am an introverted mama, and have also felt like taking time for myself is selfish – like I should be able to tough it out. But it is crucial to me being a better mama and a sane person. Plus, as you’ve said, it’s important for my son to have time with his dad and the other people in his life without me. I think that introverted mamas often get lost in the mix. I certainly judge myself for not being interested in or have the energy for more than one or two activities a week. I look at the extroverted mamas around me who do at least one thing a day and believe that I need to hold myself to that standard – that there’s something wrong with me for needing more quiet and slow time. Thanks for this. I needed it!